Do firearms leave a fingerprint? In this lab, students will learn background information on different types of firearms, and how a ballistics expert might use that knowledge to assist in crime scene investigations. Students will then use a Vernier caliper, trajectory rods and ballistic blocks to assess the bullets that are provided in this kit. 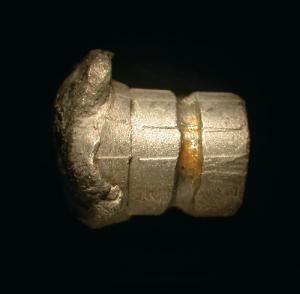 Students will obtain metric data, analyze bullet caliber, and use tools to analyze a “bullet hole”. These exercises will help students learn how to analyze damage to a bullet and connect it to a specific caliber firearm. While doing this activity students will employ NGSS Physical Science Disciplinary Core Ideas PS1 (Matter and its Interactions), PS2 (Motion and Stability), and PS3 (Energy). This kit has been aligned with all published National Standards. Pre- and Post-laboratory assessments and vocabulary words all target specific Science and Engineering Practices and common core standards. The teacher guide also contains specific “Did You Know” concepts that link the real world with the scientific standards explored. A student copymaster is also included. 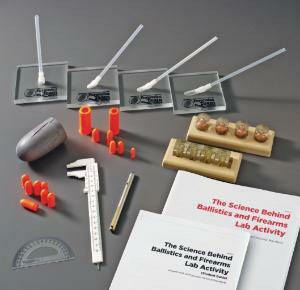 Ordering information: Kit contents include Set of embedded .45 caliber bullets, Set of embedded .45 caliber shell casings, Bullet model, Safety bullets, Ballistic blocks, Trajectory rods, Protractors, Laser pointer, Vernier calipers, Magnifying glasses, Roll of string, and Teacher and student guides. Material required but not provided is a Dissection microscope.